Dubai, UAE, May 28, 2018: With the hottest months of the year just around the corner, Olay’s innovative daily moisturizer ensures that you’ll be protected from harmful sun damage for skin that’s healthy and happy. Olay Regenerist Microscuplting Cream SPF30 combines proven anti-ageing technology and premium SPF protection with a smooth and surprisingly lightweight feel so natural you won’t even know it’s there. WHY ARE DAILY SPF PROTECTION AND PROVEN ANTI-AGEING ESSENTIALS FOR YOUNGER-LOOKING SKIN? It’s a well-established scientific fact that up to 80% of premature skin ageing comes from unprotected UV exposure. What’s lesser known is that the damaging effects of the sun aren’t limited to the beach on a two week summer holiday, but that incidental UV damage is happening all day, every day and year-round – even in the office behind a glass window on a cloudy day. As a result of this incidental UV damage, the collagen and elastin fibres in skin break down and skin loses its elasticity, and firmness, and its youthful look and feel. At the heart of Olay Regenerist Microsculpting Cream SPF30 is the proven Olay Regenerist technology, a complex of ingredients comprising Olive-M, Penta-Peptide Pal-KTTKS, Niacinamide and Lys’Lastine V® that work to re-energise skin surface cells for a more youthful look, helping firm skin that has lost elasticity from sun damage. Olay Regenerist’s proven key ingredient, the penta-peptide Pal-KTTKS (Pro Matrixyl): A fragment of a collagen molecule linked to a lipid molecule to enhance penetration into the skin’s surface layers. In clinical studies, moisturizing formulas containing the penta-peptide Pal-KTTKS were shown to help decrease the appearance of fine lines and wrinkles. Niacinamide (Vitamin B3): In multiple clinical studies, moisturizing formulas containing Niacinamide have been shown to help maintain skin’s moisture barrier and increase natural exfoliation rates in the skin’s surface layers. Olive-M: A derivative of olive oil modified to increase the penetration of anti-aging ingredients into the skin’s surface layers. In a clinical study, a moisturising formula containing Olive-Mm has been shown to help decrease the appearance of fine lines and wrinkles. Lys’Lastine V®: (Natural extract of Dill Seeds) In a clinical study, a moisturising formula containing Lys’lastine® has been shown to help improve skin’s elasticity. A further and final piece of Olay research also being presented at AAD revealed that the penta-peptide PAL-KTTKS reduced UV damage to skin cell viability and function in vitro; effects which can be related to possible prevention of photo-damage and photo-ageing5. 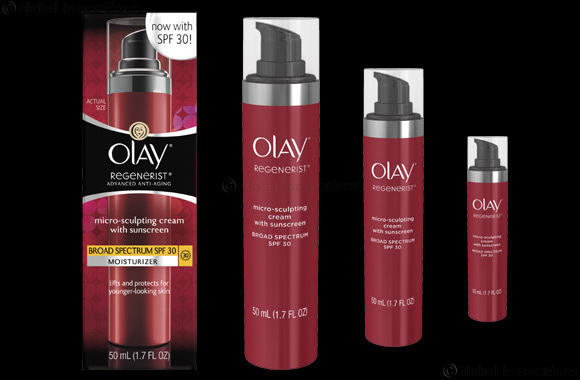 Olay Regenerist Microsculpting Cream SPF30 contains advanced Olay SolaSheer Technology™ a photo-stabilized sunscreen system which offers broad spectrum SPF30 protection against both UVB and UVA rays to help mitigate daily UV damage. Olay scientists worked to retain the effectiveness of Regenerist’s anti-ageing formula and high SPF 30 protection albeit with a surprisingly lightweight feel on the skin. This was achieved via improving the sunscreen UV filter system and by significantly reducing the amount of oily, greasy ingredients. In fact, 94% of consumers who trialled Olay Regenerist Microsculpting Cream SPF30 agreed that “it’s so super-lightweight that you really don’t notice it’s there” – so now there’s no excuse not to use SPF on a daily basis.